Let your little ones branch out with this bright crafting kit. Here is what my 10 year-old niece said about this: "Thank you for the tree gift. It was fun to make and it turned out great. It looks really pretty." My son and I had fun putting the tree together, but I was disappointed that the tips shown on the box and in one photo are multi-colored. It looks a little odd since it's very hard to cover the tips with the yarn and have it stay. My son likes it and it is a nice size, but I don't think I would recommend it because the appearance is rather oddity pink tips. Really neat idea. Pick me to win. I will go nuts on your website! I LOVE â�¤ï¸� all your stuff! Got this for my 12 year old granddaughter's Birthday. I haven't given it to her yet, but I took it out of the box. It is smaller than I expected. 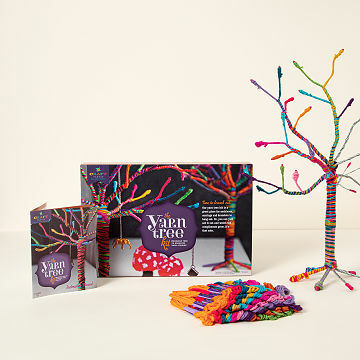 Delightful yarn tree kit for kids and grandmas too! My 15 year old loved it - did it the day she got it! I bought this gift because we saw a real yarn tree at a local museum, and my daughter loved it. Truly beautiful. Now she can create her own before she leaves us for college. My grandaughter was so excited with this. After completed, she could hang her jewelry on it. Gave this to my pre-teen daughter for Christmas. She spent most of that day "yarn-bombing" her tree! It came out looking great. She loves it and it will look wonderful in her room, displaying all of the jewelry she has made over the past year. Looks fantastic, even without the jewelry. Nice size. Easy to understand and create.